The Katyusha multiple-launch rocket system became famous in combat on the Eastern Front. 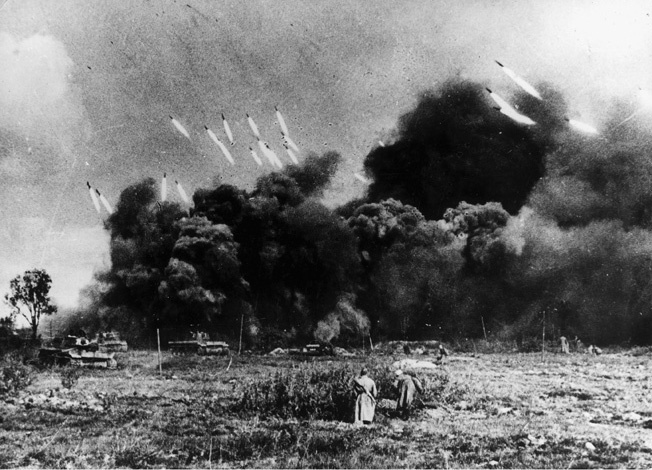 The fighting at Orsha saw the first battlefield use of the Red Army’s experimental battery of BM-13 multiple-launch rocket systems. Later in the war, these fearsome weapons were lovingly nicknamed Katyusha (Little Kate) after a popular wartime song. The development of these weapons began well before the war, in 1938, with a small trial run of 40 systems built by the time of the German invasion. The prototypes of BM vehicles had mounted launchers at right angles to their long axes; however, this proved very unstable and the launch rails were remounted lengthwise. The command staff of the first field battery, headed by Captain Ivan A. Flerov, included two civilian advisers to train the crews, A.I. Popov, one of the creators of the launch platform BM-13, and D.A. Shytov, one of the developers of the M-13 round. The first battery consisted of nine launch systems in three firing platoons, a fire direction platoon with one 122mm howitzer for fire correction, an ammunition platoon, a transportation platoon, a POL (petroleum, oil, and lubricants) platoon, and a medical detachment. One volley of this battery delivered 112 132mm M-13 rockets with high explosive or fragmentation rounds. The highly mobile battery numbered 44 trucks, allowing the transport of 600 rounds of ammunition and enough fuel, POL, and food for at least three days of operations. The first application of the Katyusha’s firepower was directed at Orsha’s railroad station. While not intended for pinpoint accuracy, the new weapon system delivered a devastating amount of fire over a wide-area target, destroying several trains and causing significant German casualties. The success of its first combat deployment kicked the production of BM-13 systems into high gear, and close to 10,000 systems of all types were produced by the end of the war. In addition to the original BM-13 models, there were multiple variations of 81mm BM-8 systems, some of them mounted on jeeps, and heavy BM-31 launchers for 310mm rockets. The special place of the Katyushas in the Soviet arsenal earned them the official title of Guards Mortars. The Germans called them Stalinorgel, meaning Stalin’s Organ. In the early stages of the war, the Soviets took great pains to safeguard these weapons, with the immediate security of Katyusha batteries provided by detachments of NKVD (secret police) troops. In cases when a launch vehicle became disabled and retrieval was impossible, it was blown up in place to deny the Germans an intelligence coup. Battery commanders were responsible with their lives for the destruction of disabled launch vehicles. Just such a fate befell Captain Ivan Flerov’s battery. Caught in a cauldron at Vyazma in October 1941, with his vehicles immobilized by marshy terrain and out of ammunition, Flerov ordered them blown up. When fewer than a third of the battery’s soldiers made it out of the encirclement alive, Captain Flerov was not one of them. Katyushas were inexpensive and uncomplicated to produce and easily mounted on many platforms, initially including only trucks but quickly progressing to tanks, tractors, armored trains, and even small naval vessels. Later in the war, many Lend-Lease tanks, which the Soviet specialists did not consider to be up to the task of armored warfare on the Eastern Front, were used as mounting platforms. However, American Studebaker two-and-one-half- ton trucks were highly regarded for their off-road performance, and thousands of them were used as mounting platforms for Katyushas. The end of World War II did not end the Katyushas’ service. Thousand of them were exported to Soviet client states during the Cold War and were built in several countries under license. American forces faced them during the Korean War and decades later in Iraq. Tags Allies, Axis, Battle of Smolensk, BM-13 Katyusha, NKVD, Red Army, Soviet Union.